Challenging targets, such as GPCRs and RTKs, are very attractive for drug discovery because they are easily accessible on cell surfaces. Yet, it is exactly this feature which makes assay development so difficult – these membrane proteins are usually not stable enough upon purification. We therefore invested in establishing RTK and GPCR assays to provide our clients with ready-made solutions, which require little investment. Our established biochemical assays enable measuring affinities and kinetics of label-free ligand-GPCR interaction. The assays leverage carefully optimized solubilization conditions that allow production of monodisperse GPCR particles. Available for CXCR4, CXCR7, CCK2, NTSR1, ADRB2, NOP, ETA, KOR, chimeric MOR, AT1, SST2, APJ and NK1. Please contact us for a quote. 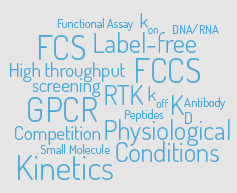 If you don't find your GPCR assay among the established ones, we are happy to discuss feasibility of a customized solution.